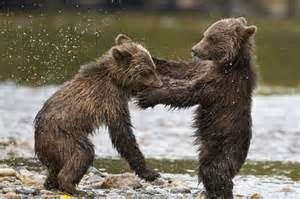 From Disneynature, the studio that brought you Earth and Chimpanzee, comes the must-own true life adventure Bears, an epic story of breathtaking scale, this heartwarming and visually spectacular film showcases a year in the life of a bear family as two impressionable young cubs are taught life’s most important lessons. Set against a majestic Alaskan backdrop, their journey begins as winter ends. Emerging from hibernation, the three face the bitter cold and an exciting but very risky outside world. Astonishing footage captures the fast-moving action and suspense of an endearing family to live life to its fullest in one of the planet’s last great wildernesses. 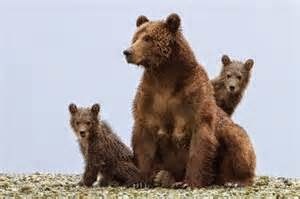 John C. Reilly narrates a beautiful story of a mother bear, Sky, and her two cubs, Amber and Scout, as they journey from the snowy mountaintop to the Alaskan coast in search of enough food to sustain them through the next winter. In their way are two alpha bears, Magnus and Chinook, who both want to snack on the cubs. Sky must protect her babies at all costs, which includes leaving the area where food is abundant to areas where food is scarce. 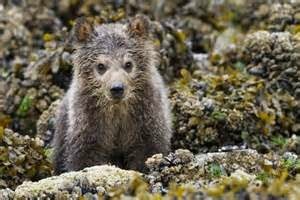 Arriving at some mudflats, Sky teaches the cubs to search for food and as the tide comes in, they retreat to the coast. But, when Scout gets caught farther out and can’t get back, Sky can only watch as her baby tries to make it back. Knowing her window to find an adequate food supply for her and her cubs, Sky tentatively returns to the meadow where she again encounters Mangus and Chinook. After once again defeating them, Sky and her cubs make their way up river to wait for the salmon to swim upstream. As they travel, Sky teaches her cubs the way of life, showing them how to find food, and in a peaceful pool, she teaches them how to forage for mussels and hidden fish… enough to tide them over for a little while, but not enough to keep them alive through the winter. Finally, Sky and her cubs make it to the golden pond, where the salmon are teeming. It’s just in time, too… winter is coming and Sky needs to teach her babies to hunt and fill their bellies with enough protein to help them survive the winter hibernation. Sky is able to keep her babies alive by replenishing her milk supply and also teaches her babies valuable life lessons. After successfully feeding, Sky, Amber and Scout make their way back up the mountain to their den, where they will settle in for the winter, full of food, warmth and safety. I am a huge nature documentary fan. I can honestly say I’ve seen Planet Earth about a dozen times. With Bears, Disneynature knocks it out of the park. John C. Reilly’s narration was perfect – his tone, his expressive comments, the script – all of it. Wonderful. The bears themselves were beautiful and cute and cuddly and I really wanted to just squeeze them. Reilly’s narration gave them personality and by the end, I could really hear them “thinking” the things Reilly was saying. The 1080p high definition 1.78:1 presentation of Disneynature Bears is perfect. I have never seen such bright colors, such a clear picture and such wonderful underwater work. Every frame was right on and everything was so sharp, it almost seemed like I was watching the film in 3D. Every moment filmed was clear and underwater shots we so clear, it was like looking into a crystal clear aquarium. Alaska was a good choice to film and after watching, I really want to go there and see the beautiful area for myself. Disneynature Bears’ 5.1 DTS-HD Master Audio is almost perfect. The narration volume is right on, but background music was a little loud and I had to adjust the volume down just a little bit. 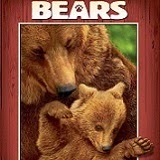 John C. Reilly’s narration was clear and intelligible, the bears’ calls were natural and background music good. I loved listening to this documentary. The film is also available in English 2.0 descriptive services, French 5.1 Dolby Digital, and Spanish 5.1 Dolby Digital. Subtitles are also available in English for the Hearing Impaired, French and Spanish. 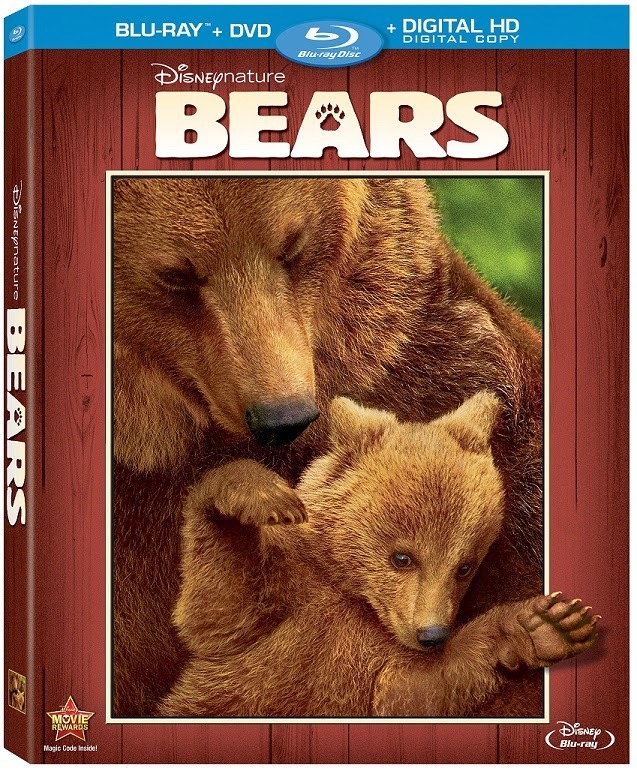 Every feature included is a mini-documentary, teaching the viewer about the bears, their environment, food, etc. Each feature talks about something different and especially highlights the need for conservation. Welcome to Alaska – The crew talks about filming in Alaska and the challenges they overcame to find Sky and her cubs and film the movie. The Future for Bears – The crew interacts with the bears and discusses conservation efforts and what might happen if they are not protected. 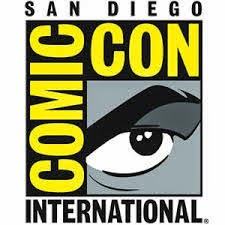 Included is information about their environment and how everything affects everything else and if one part of the chain dies or changes, it affects everything connected to it. This feature includes a visit by Dr. Jane Goodall, one of the world’s foremost conservationists. A Guide to Living with Bears – Talking with the crew about living among the bears for so many months and how difficult it was to safely interact with the bears. The guides taken along were experts in bears and how they were able to read them and figure out their moves. How Did They Film That? – A talk about the time and effort it took to film the bears. Using aerial shots to compliment the ground shots. Filming took two years and finding Sky and her cubs’ den was difficult. They had one shot at finding Sky and getting her and the cubs emerging from their warm den in the spring. 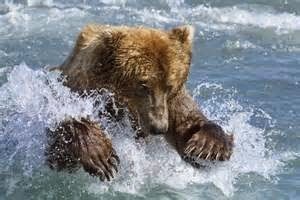 Filming in the water was just as difficult as the cameraman/diver had to sneak into the water near the bear and get it on film. “Carry On” Music Video by Olivia Holt – Olivia Holt sings her song “Carry On.” The video shows shots of Sky, Amber and Scout. I can’t recommend this film enough. It’s a near-perfect documentary on bears, a beautiful animal in the Alaskan wilderness. The picture was flawless and the audio, while a little uneven was really good. I found myself rooting for Sky, Amber and Scout and fell in love watching Scout being the rebel and trying to do things on his own, only to need to call his mama when he needed help. As much as I love Planet Earth I love this more. 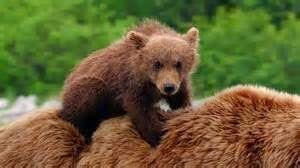 Disneynature put together a wonderful look at bears in their natural environment, teaching their babies how to live, all the while defending them and protecting them. I will definitely include Disneynature’s Bears in my nature documentary rotation and I’ve already recommended it to others.